The London Pass provides free entry to over 60 top attractions, tours, museums and sights in London and Fast Track Entry to a selection of the most popular attractions. Choose between 1, 2, 3 or 6 day options. Regardless of long you stay in London you can save time and money with the London Pass! - Book with or without an Oyster card included. Once you’ve bought a London Pass you don’t have to pay to get into any of the attractions it covers. Simply show your card at the entrance or ticket office of any attraction included on the London Pass, they will scan it and you will be allowed entry. 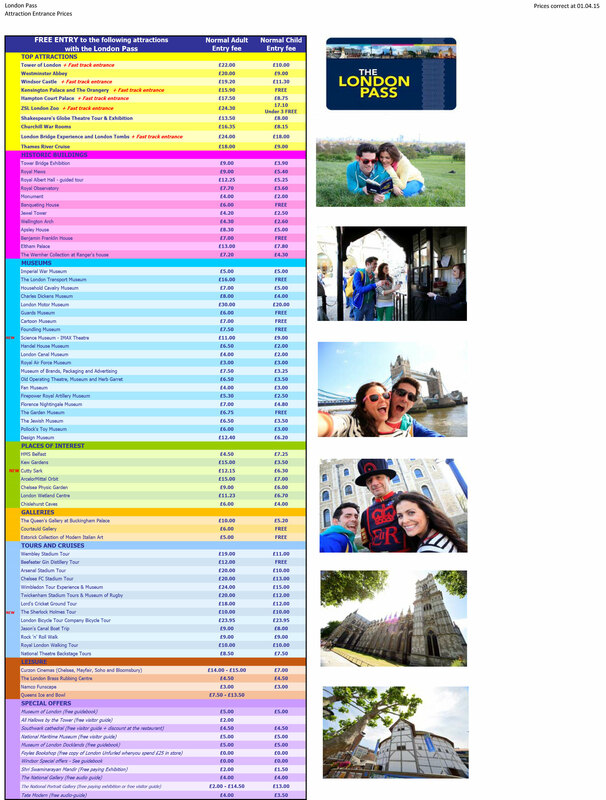 See list of all 60 attractions included in the London Pass here! Shortly after your booking is complete your e-ticket will be send directly to your email, just print it out and bring it with you to London. Once in London, please collect your London Pass at: The London Pass redemption desk, The Tourism Island, 11a Charing Cross Road, London, WC2H 0EP. You must bring a valid picture ID and the credit card used when booking the tickets when you come to collect the ticket at London Pass redemption desk. Please note that the person who booked the ticket(s) need to bring a photo ID (e.g. a passport), when collecting the London Pass. How long is the London Pass vaild? The London Pass is vaild for either 1, 2, 3 or 6 consecutive days. If you decide to book your London Pass with an Oyster Card included, you will obtain the Oyster card when you collect your London Pass in London. The Oyster card is the best way to get around in London. It provide access to London’s underground (the Tube), public transport buses and can also be used on the Gatwick Express and Gatwick Thameslink trains. Just remember to check in and out when travelling so the correct amount is deducted from the card each time, and if you use up all the pre-paid credit on the Oyster card, you can top it up for any amount you need at any underground station. Children under the age of 11 travel free when travelling with an adult using a vaild Oyster card. Children between the ages of 11 and 15 years old can book a London Pass with a Travelcard. Anybody 16 or older must book an adult ticket. Monday to Sunday 10:00hrs - 16:30hrs. Closed: 25th and 26th December and 1st January.